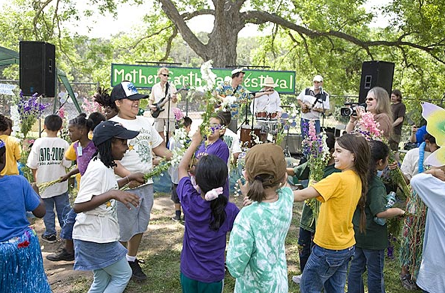 Mother’s Day is this weekend and you’ll have a chance to celebrate the ULTIMATE mom this Friday, May 9 at the Mother Earth Day Festival from 9 am – 1 pm in Zilker Park near the Barton Springs pool! We love our city and love any opportunity to learn more about how to take care of it, it’s important we pass it on to our kids. The Mother Earth Day Festival was started by Bill Oliver who has been singing to children and families to promote environmental awareness for over 30 years. This 13th annual event will be an interactive learning experience for kids that highlights the importance of our habitat, water conservation, and endangered and protected species. The festival will focus on environmental awareness and how it relates to Barton Creek and Barton Springs. Kids of all ages will enjoy puppet shows, magic, interactive exhibits, maypole dancing, art projects and performances by Sara Hickman, Bill Oliver and the Otter Space Band, the Hey Lollies, and a special appearance by the Ortega Super Star Choir. It will be a fun and educational day! The event is FREE and will be located in the picnic table area next to the Barton Springs pool and across the parking lot from the Zilker Hillside theater. School groups are encouraged to RSVP to MrHabitat@aol.com . See you there with your salamander sock puppet on! * In the event of rain, the festival will be held on May 16.